The Miles by Discover Card is a travel credit card which allows cardholders to earn points which can be redeemed for travel credits, gift cards or cash. With the Discover Miles card, basically you earn one mile for every dollar you spend on the card, and there is no cap to the number of miles you can earn. You can redeem your miles for cash (starting at 5,000 miles), a Discover gift card, by making a charitable donation, by selecting a gift card from 90 brand name-partners, or for travel. While the Miles By Discover Card allows you to earn one mile for every dollar you spend using the card, in addition you’ll get Double Miles on up to $3,000 in travel and restaurant purchases each year. The list of eligible travel purchases includes airline tickets, hotels, car rentals, cruises, tours and vacation packages purchased through travel agents, and online travel sites. And you’ll get 1 Mile for every $1 you spend on all your other purchases. The Miles you earn have no expiration date. However, you forfeit your miles if you don’t use the card for 18 months, fail to make a minimum payment for two consecutive billing cycles, or your account is closed. 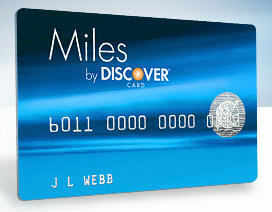 You can apply online for the Miles Card or over the phone by calling 1-800-DISCOVER (1-800-347-2683). The Miles By Discover Card has no annual fee, whichis exactly what we want. As to charges, you get a 0% Intro APR for six months on purchases and balance transfers. Then the APR rises to between 10.99% and 15.99%. The average daily balance method is used to calculate monthly balances. People who like The Miles by Discover Card usually want to earn points for travel yet want to be able to book their own travel itinerary and use their own travel agent connections rather than have to use the in-house travel agents of the credit card company.